This is the last of five images in the Homestead series…each photograph was taken from a different perspective and processed with a different finish. To view the other four photos, you can scroll to the bottom of the page and then click on “Homestead Series” under the Categories list. It might be the color, but this rendering strikes me more as an abandoned dwelling…maybe it’s because the mountains and trees that were visible in the other versions are missing and there is a feeling of derelict solitude here…I’m not sure…. This is the fourth of five images in the Homestead series…to see the other photographs, you can scroll to the bottom of the page and click on Homestead Series under the Categories icon. This is the third of five images in the Homestead series…different images of the same abandoned buildings on a property located a few miles north of the Salt Lake City airport. If you look through the trees on the left side of the photograph, and immediately above the second fence post from the left, you can see the air-traffic control tower…and the mountains in the background are the extreme northern end of the Oquirrh Mountains, the range that forms the western boundary of the Salt Lake Valley. To provide a bit more of a location reference, the Great Salt Lake is a few miles to the back and right of the image…. To see the other photographs in the Homestead series, you can scroll to the bottom of the page and click on Homestead Series under the Categories icon. 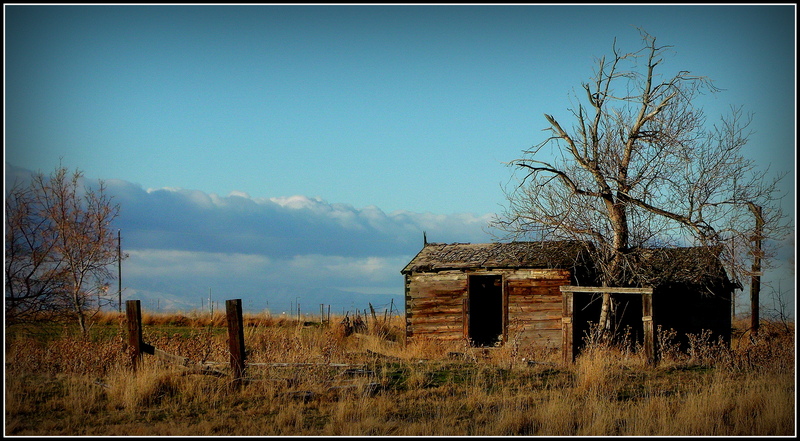 This is the second image in the “Homestead” series, a collection of photographs of a particular setting, taken from slightly different perspectives and with various post-processing finishes that I have effected with Picasa. You can view the first/original photo by clicking here if you’d like to refresh your memory or have an immediate comparison for this black and white rendering…. Or, to see all of the photographs in the Homestead Series, you can scroll to the bottom of the page and click on Homestead Series under the Categories icon. This was the first of five images in the Homestead series…to see all of the photographs in the collection, you can scroll to the bottom of the page and click on Homestead Series under the Categories icon.